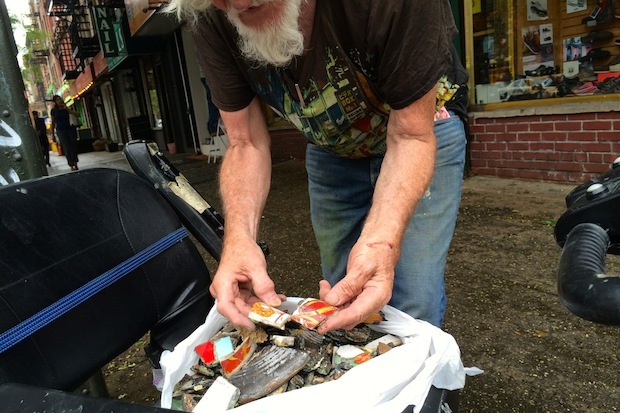 EAST VILLAGE — Jim "Mosaic Man" Power began tearing down his multicolored mosaics from lampposts around Astor Place Wednesday as a preemptive strike against the city, which had planned to remove the art, he said. Power, a Vietnam War veteran who has decorated dozens of poles across the East Village over the years, said he is furious over the city's planned $16 million redesign of Astor Place, which will require workers to take down his meticulously designed public artwork, officials confirmed. “I ain’t stopping. I’m going to do it this way,” said Power, 67, as he sat on his red mobility scooter on the corner of St. Mark’s Place and First Avenue. He started by taking down part of the mosaic at the corner of Cooper Square and Astor Place Wednesday morning, using a chisel and a hammer. The pole has "Bloomberg" spelled out in orange tiles, as well as the phrase "United We Stand." Power plans to remove all seven of his lamppost artworks in the area by next week. ► QUIZ: What Plants Should You Grow in Your Apartment? The city had planned to remove Power's decorated poles from Astor Place this fall as part of a redesign to make the area more pedestrian-friendly, according to a Department of Transportation spokeswoman. The lampposts were set to be preserved "because they are historic artifacts" but the department had not yet decided where they would be kept, the spokeswoman said. The DOT had hoped to "incorporate the light poles into the new plaza design," the spokeswoman said. Power, though, grew disillusioned when he said he couldn't get a firm commitment from the city about when and where the artwork would be reinstalled. "They haven't said nothing," he said. During a meeting with the city several months ago, officials told him the mosaics might be transported to Queens during the construction, and they also said that an artwork in Power's honor could be added to the final Astor Place design, Power recalled. But since he opposes the Astor Place changes, Power said the idea was unacceptable. The DOT did not immediately respond to the news that Power was taking down his work Wednesday. Power has spent the last 30 years adorning city light posts, benches and planters with his tile work. He has decorated dozens of lampposts in the neighborhood, which make up the "Mosaic Trail," and his work has been featured in guidebooks. Power decided to take down the Astor Place mosaics as a way to “preserve the identity of a community that is global, that is artistic [and] that is its own beauty," he said. He plans to incorporate the removed tiles into new mosaics that he will install on lampposts on St. Mark’s Place, he said. “I look at this as a recycling process. Something better will come out of it,” he said. William Kelley, executive director of the Village Alliance, said he was disappointed by the loss of the mosaics, which the Alliance had encouraged the city to preserve. East Village resident Nicholas Nessen said Power's light pole mosaics were an important part of the neighborhood. “When the neighborhood was not in such good shape, if anybody is old enough to remember that, it was the mosaics that gave this neighborhood hope — it gave them light,” said Nessen, a 39-year-old real estate agent. He added, “You take the mosaics down [and] it’s like taking the history of the neighborhood out."